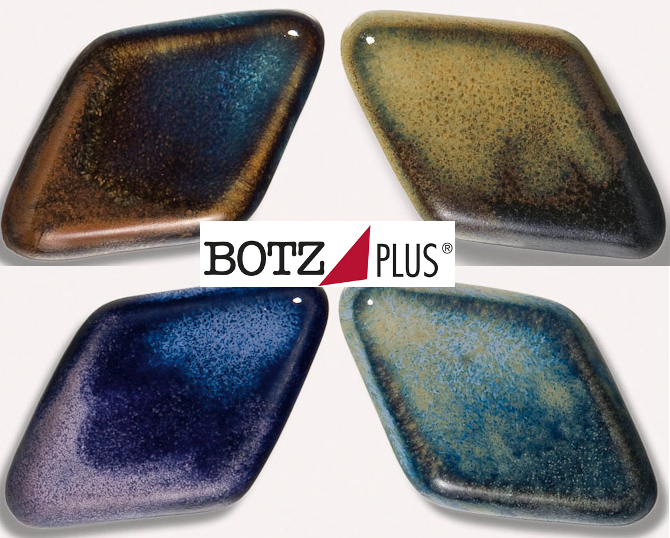 Botz Plus is a white glaze layer, applied on top of stoneware glazes, which mixes and applies an effect. 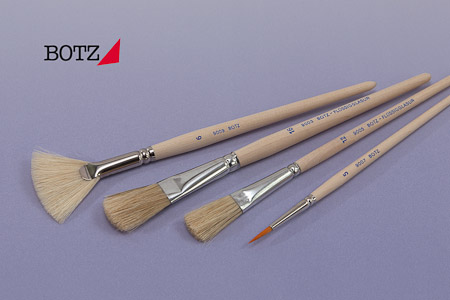 Lower the firing temperature to 1150°C when the whole object is glazed-over with Botz Plus. With partial application of Botz plus fire at 1220°C-1250°C. Botz Melting point reducer is applied on Botz Stoneware glazes to lower the melting point to about 1150°C. Add 5 to 10 grams of Melting point reducer to 100 grams of stoneware glaze. Stir well, apply 2-3 layers. General rule: Add 3 tea spoons of Melting point reducer to 200mL glaze. With 9870, 9873, 9898, 9899 only use 1,5 tea spoon. Simple inexpensive boar bristle brushes. A good quality fan brush and round selected filament brush for decoration. Protects kiln shelves from glaze sticking to them. When glaze has been spilled, it can be removed with a trowel. Apply Botz 9010 in three thick layers to the upper side of the shelve. Let each layer dry. The great advantage over the use of sand is that the paste is secured to the shelve and the kilns stays clean. 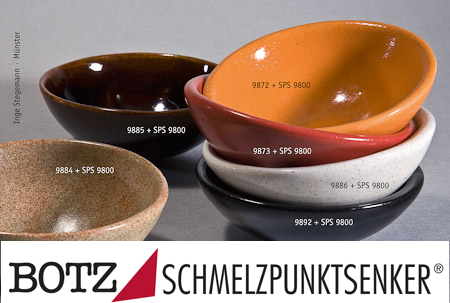 Botz glazes can be used for raku firing when the right melting temperature is reached. Colours will differ because of reduction. There are lots of good results with raku fired Botz glazes. See the download below for raku fired results. Clay and glaze is very bad for the sewer system and can make blockages in your drain because it becomes very hard. 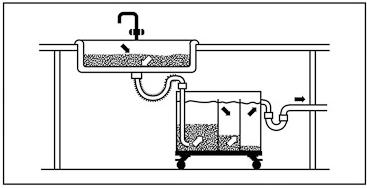 Problems can be prevented by installing a settling tank between your sink and the drain. An absolute must.